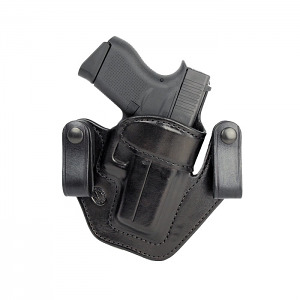 Milt Sparks Versa Max 2 for the Glock 43 9mm pistol, right hand, black with 1 1/2" belt loops. First, I would say dealing with Top Gun was a pleasure. The holster was shipped and received right away. Milt Sparks makes an excellent holster. I carry every day in a Milt Sparks holster and it is very comfortable. I also have one for a commander sized 1911. I don't think a person would be disappointed in the holster or Top Gun. You just can’t go wrong with Milt Sparks holsters. This is my third VM2, the first two for 1911’s and this one is for the glock 43. I wear this between 3 and 4 o’clock position and find it comfortable standing and sitting. It doesn’t place the gun in a deep concealed position, making it easy to get a full grip before drawing. Highly recommend. This is my 4th Versa Max2. They are quite simply the best IWB holster available, that's why the design has been copied by so many others. When paired with a good gun belt, it's easy to forget its there. I already own two Milt Sparks Versa Max II holsters for other guns & I have been using them for 15 years. I swear by them for concealed carry. I have carried a steel 1911 Gov’t model under a t-shirt, without being detected in gun free zones, as an off duty LEO, many times. They just work FOR ME, but for many others as well. Top Gun Supply did a fantastic job of getting me this holster in record time. It was a last minute purchase that I was lucky to find in stock ANYWHERE in the US, so I was very greatful to Top Gun Supply for getting it out the door so quickly. The Milt Sparks VM2 holster is the best IWBN I have ever had. Have one for each of my concealed carry weapons, and that is quite a few. Ordering from Top Gun is very easy and they normally have what I want in stock, and don't have to wait for it to be made in six weeks or so.